Bartlesville High has its last regular season road game at Sapulpa on Tuesday evening, and both sides of the girl’s and boy’s double-header will be a challenge. The Lady Bruins take on a Sapulpa team that is 11-7 on the year and has won four games in a row. The Lady Chieftains have not lost since Jan. 18. The Bartlesville girls are trying to find some momentum going into regionals next week. Two of the Lady Bruins four losses have come in the last two weeks. The BHS girls are 16-4. On the guy’s side, Bartlesville is riding a two-game win streak after topping Bixby on Friday and Sand Springs on Tuesday of last week. The Sapulpa contest is an opportunity for BHS to beat another top-5 team in class 6A. The Chieftain guys are 16-3 and are ranked at No. 4 in the state. It could be a preview of next week’s regional title game, as the Bruin guys will be in the Sapulpa regional. 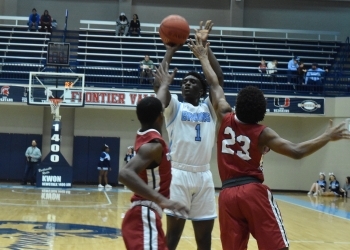 Finding energy on the road is the next step for Bruins, who have not been the same away from Bruin Fieldhouse, here is Bartlesville head coach Clent Stewart. Ladies tip at 6:30 PM with the guy’s to follow around 8:00 PM. We will have both those games on KWON – AM 1400 and FM 93.3. Also available online at BartlesvilleRadio.com and on the free to download Bartlesville Radio App. This is one of only three regular season games left for Bartlesville basketball.